By February 2017 Esteyco successfully finalized the first test campaign scheduled on the TELWIND H2020 project. The fundamentals of the technology were demonstrated, and the platform behaves as expected with the two bodies moving solidary as a single system. 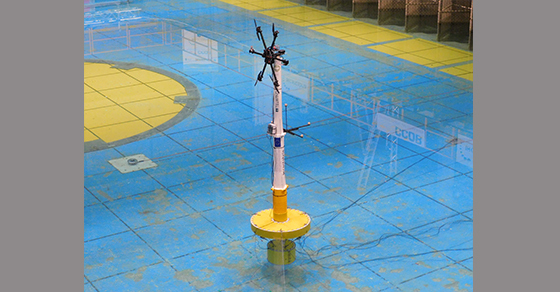 Beyond this finding, a full set of tests were performed at IHC facilities, including the simulation of wind turbine effect by means of a multi-fun device. The platform shows an amazing response both in operating and survival conditions. 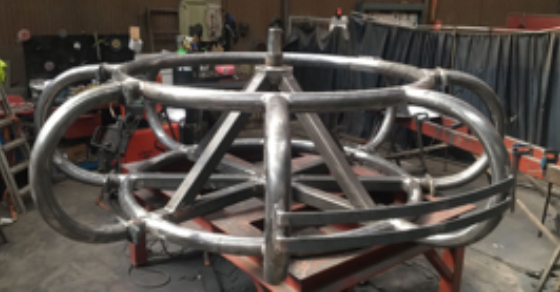 Some other findings bring the opportunity to proceed with the optimized design of suspension tendons and the mooring system. These tests provided also valuable information to calibrate and validate the numerical models. 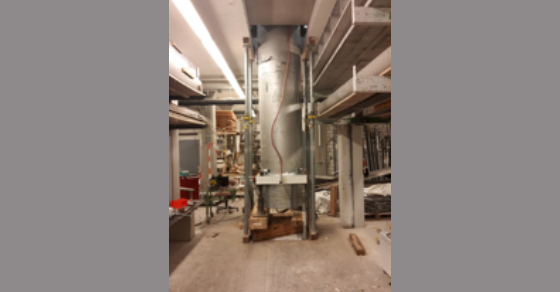 A dedicated experimental testing and validation campaign is carried in the Technische Universitat Munchen (TUM) , to demonstrate the suitability of the suspension tendons. Testing shall cover both durability and structural performance, with a focus to fatigue loading. The testing of proposed monitoring systems is also being part of the experimental campaign. Coordination is held by DSI and TUM, bringing their experience in design and testing of stay cables. 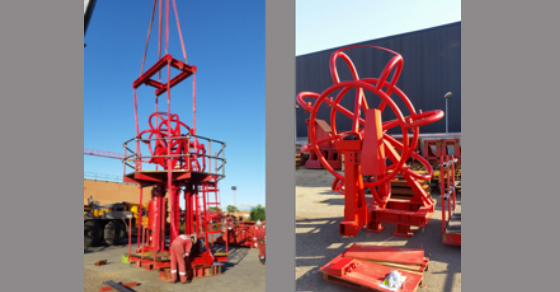 After months of intensive development, ALE heavy lift has accomplished the upgrading of its equipment to enhance the lifting operation of ESTEYCO´s proprietary telescopic tower. This development improved the lifting speed ratio and ease handling of lifting cables by means of a purpose built recoiler, increasing at the same time the safety of this operation. 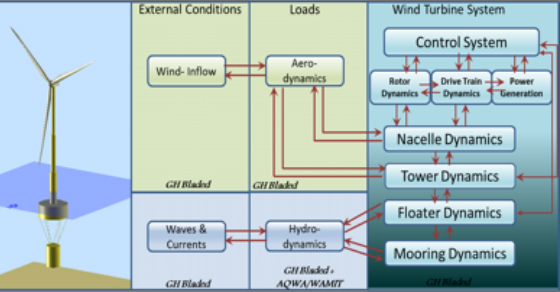 The development of fully coupled models are the cutting edge of the floating wind sector. 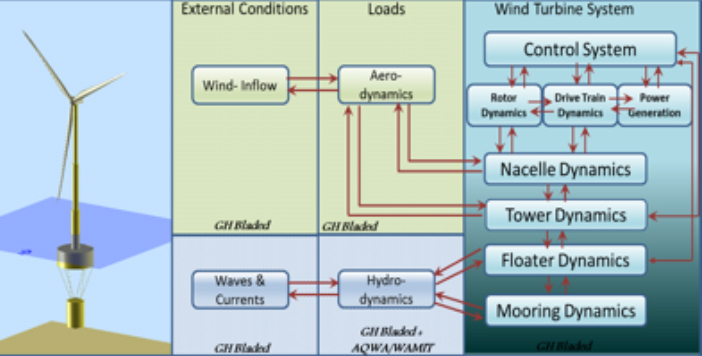 Thus, these tools are key element to demonstrate the feasibility of floating solutions. MECAL in collaboration with ESTEYCO and IHC built a fully coupled numerical model using the industry recognized software BLADED. This model is calibrated against the results from scaled (1:45) tank tests. 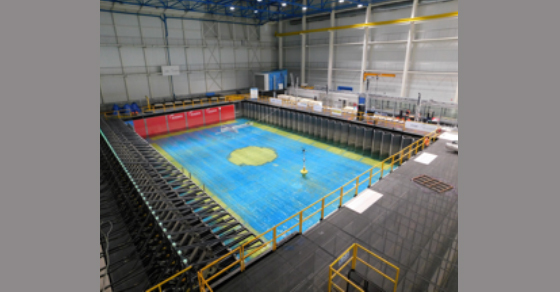 Advanced control brings down tower bottom bending moment by 21% (compared to baseline controller) for floating turbine. 9 % and 16.5 % reduction in CAPEX of RNA and tower could be expected (respectively) when using advanced control for floating turbine. Optimization of platform damping (lower loads) and (higher) energy yield could be achieved using by further enhancement of advanced floating controller. 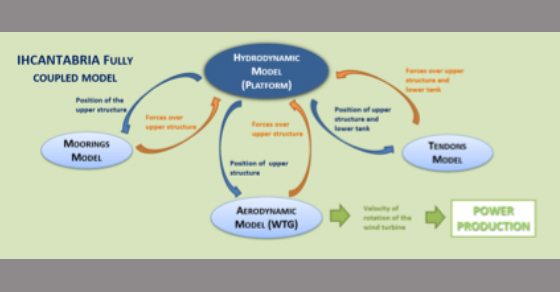 The simulation of the fully coupled multibody configuration has been achieved creating a purposed built inhouse code that comprises the mooring system, the suspension tendons, the wind turbine, the tower and the upper and lower bodies. Based on exhaustive testing campaign, the advanced numerical model developed by IHC has been calibrated and validated showing an accurate match with the scaled test results. This tool is allowing for a cross check of Bladed model results. 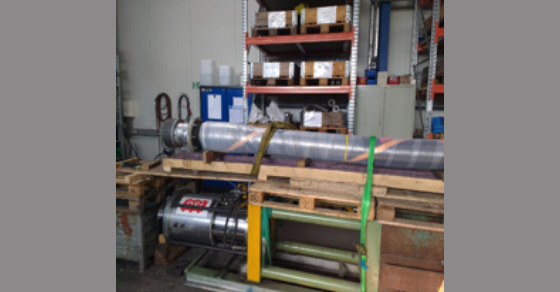 The final objective is to demonstrate the concept reliability and feasibility by means of two numerical independent models, contrasted by intensive tank testing campaigns and finally supported by a “third party assessment” performed by a renowned certification bodies such as TUV SUD-Class NK.